The song was originally released in 1990, when it peaked at number four on the US Album Rock Tracks chart (now the Mainstream Rock chart). It was then released worldwide in 1993, reaching number one in Poland, number two in Spain, and also charting in Australia, Belgium, the Netherlands, Norway and New Zealand. Several regions instead saw the release of The "Civil War" EP, including Ireland and the United Kingdom. The EP reached number 11 on the UK Singles Chart and number 15 on the Irish Singles Chart. Basically it was a riff that we would do at sound-checks. Axl came up with a couple of lines at the beginning. And... I went in a peace march, when I was a little kid, with my mom. I was like four years old. For Martin Luther King. And that's when: "Did you wear the black arm band when they shot the man who said: 'Peace could last forever'?" It's just true-life experiences, really. "Civil War" reached number four on the Mainstream Rock chart in Billboard magazine. The song was first played at Farm Aid 1990, the first and last time the song was played with original drummer Steven Adler. The song was played many times from 1991 through 1993, though after 1993 the song was not performed again until December 4, 2011 at the Bridgestone Arena in Nashville, Tennessee. As of 2017, the song is played at almost every show. The song samples Strother Martin's speech in the 1967 movie, Cool Hand Luke: "What we've got here is... failure to communicate. Some men you just can't reach. So you get what we had here last week, which is the way he wants it... well, he gets it. I don't like it any more than you men." It quotes a speech by a Peruvian Shining Path guerrilla officer saying "We practice selective annihilation of mayors and government officials, for example, to create a vacuum, then we fill that vacuum. As popular war advances, peace is closer". The song also includes the American Civil War song, "When Johnny Comes Marching Home", whistled by Axl Rose in the intro and outro. 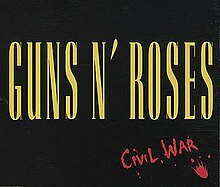 "Civil War" is the B-side track to the June 1991 release of Guns N' Roses "You Could Be Mine" single, the promotional single for Terminator 2: Judgment Day. However, "Civil War" was not featured in the film. Of the 30 combined tracks on Use Your Illusion I and Use Your Illusion II, "Civil War" (Track No. 1 on Use Your Illusion II) is the sole track to be recorded featuring original Guns N' Roses drummer, Steven Adler, who was fired shortly after the track's recording in 1990. Adler was replaced by then-drummer for The Cult, Matt Sorum, the drummer for all other 29 tracks on the two-disc set. This song was covered by the band Hoobastank for a "stripped" or acoustic set. ^ McKagan, Duff (September 27, 1993). "Interview". Rockline (Interview). Interviewed by Bob Coburn. Los Angeles. ^ "Australian-charts.com – Guns N' Roses – Civil War". ARIA Top 50 Singles. Retrieved March 25, 2017. ^ "Ultratop.be – Guns N' Roses – Civil War" (in Dutch). Ultratop 50. Retrieved March 25, 2017. ^ "Dutchcharts.nl – Guns N' Roses – Civil War" (in Dutch). Single Top 100. Retrieved March 25, 2017. ^ "Charts.nz – Guns N' Roses – Civil War". Top 40 Singles. Retrieved March 25, 2017. ^ "Norwegiancharts.com – Guns N' Roses – Civil War". VG-lista. Retrieved March 25, 2017. ^ "Notowanie nr598" (in Polish). LP3. July 30, 1993. Retrieved March 23, 2019. ^ Bond, Callan (February 8, 2006). "Questions and Answers". Cool Movie Trivia. ^ de Lama, George (July 9, 1989). "`More War Will Bring Peace,` Say Peru`s Maoists After 15,000 Die". Chicago Tribune. Retrieved March 4, 2014.